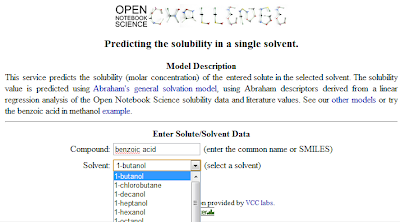 Making solubility estimations for most organic compounds in a wide range of solvents freely available has always been a main long term objective for the Open Notebook Science Solubility Challenge. With current expertise and technology, it should be as easy to obtain a solubility estimate as it is now to get driving directions off the web. Obviously this won't be attained purely by exhaustive measurements, although we have been focused on strategic measurements over the past two years. In parallel, we have been constantly evaluating the various solubility models out there for suitability. Although there are several solubility models available for non-aqueous solvents, our additional requirement for transparent model building has proved surprisingly difficult to satisfy. 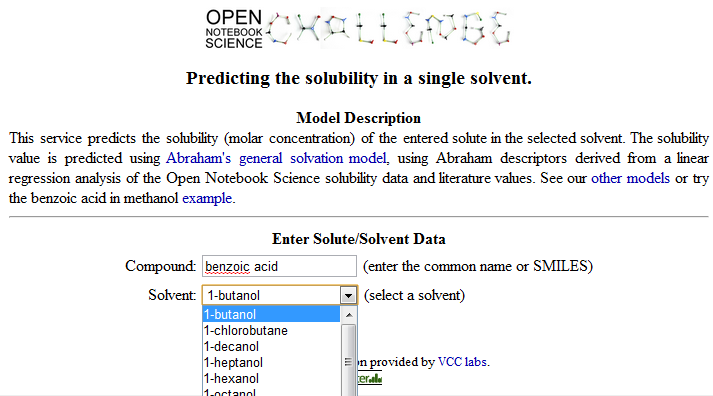 From this search, the Abraham solubility model [Abraham2009] floated to the top, with an important factor being that Abraham has made available extensive compilations of descriptors for solutes and solvents. In addition the algorithms used to convert solubility measurements to Abraham descriptors (a minimum of 5 different solvents per solute) has allowed us to generate our own Abraham descriptors automatically simply by recording new measurements into our SolSum Google Spreadsheet. These can be obtained in real time as well. This approach permitted us to provide predictions for a limited number of solutes in a wide range of solvents and we have included these predictions in the past two editions (2nd and 3rd) of the ONS Challenge Solubility Book. Coming at the problem from a different approach, Andrew Lang has also been trying to predict solubility using only open molecular descriptors, mainly relying on the CDK. Since our most commonly used solvent has been methanol, Andy recently generated a web service to predict solubility in that solvent. The idea is to use a Random Forest approach to select freely available descriptors to predict the Abraham descriptors for any solute. A separate service then generates predicted solubilities for a wide range of solvents based on these Abraham descriptors. I'm using the term "freely available" because - although the CDK descriptors and VCCLab services are open - the model requires 2 descriptors only available from ChemSpider (ultimately from ACD/Labs). Here is an example with benzoic acid. 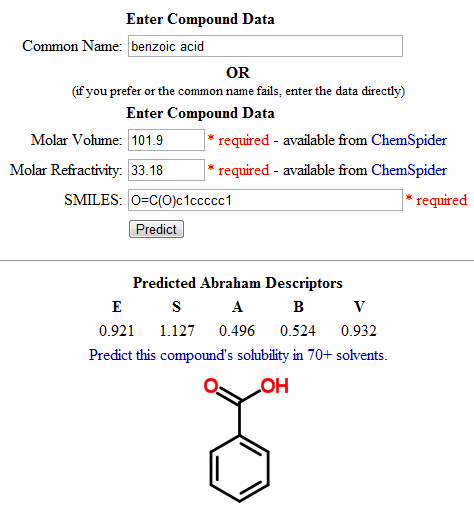 As long as the common name resolves to a single entry on ChemSpider, it is enough to enter it and it automatically populates the rest of the fields, which are then used by the service to generate the Abraham descriptors. Hitting the prediction link above will automatically populate the second service and generate predicted solubilities for over 70 solvents. This approach of allowing people to access these components separately can be useful. It can be instructive to manually play with the Abraham descriptors directly to see how predicted solubilities are affected. There are also situations where one has experimentally determined Abraham descriptors for a solute and bypassing the descriptor prediction step is required. However, for those who prefer to cut to the chase, a convenient web service is available where the common name (or SMILES) of the solute is entered and the list of available solvents appears as a drop down menu. Now here is where I think the real payoff comes for accelerating science with openness. 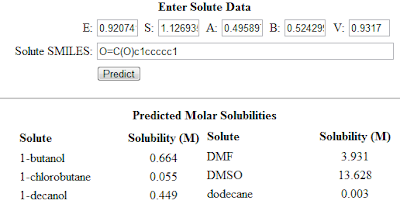 Andy has also created a web service that returns the predicted solubility in molar as a number from common names (or SMILES) for solute and solvent via the URL. For example click this for benzoic acid in methanol. The advantage here is that solubility prediction can be easily integrated as a web service call from intuitive interfaces such as a Google Spreadsheet to enable even non-programmers to make use of the data. 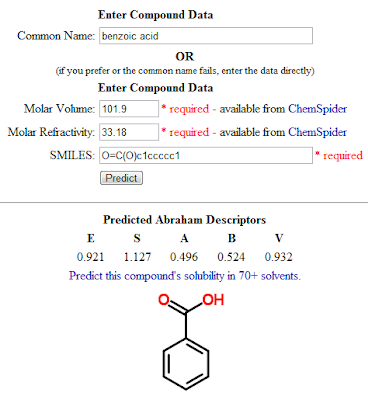 Notice that the web service provided in the fourth column for the average of measured solubility values enables an easy way to explore the accuracy of specific predictions. Such web services could also be integrated with data from ChemSpider or custom systems. If those who use these services feed back their processed data to the open web, it could take us a step closer to automated reaction design. For example consider the custom application to select solvents for the Ugi reaction. Model builders could also use the web services for predicted and measured solubility directly. A while back we explored using Taverna for MyExperiment to create virtual libraries of SMILES. Unfortunately we ran into issues with getting the applications developed on Macs to run on our PCs. 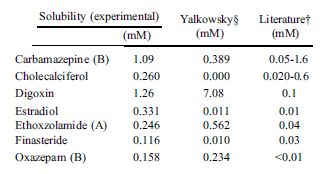 This might be worth revisiting as a means of filtering virtual libraries through different thresholds of predicted solubility. Andy has described his model in detail in a fully transparent way - the model itself, how it was generated and the entire dataset can be found here. We would welcome improvements of the model as well as completely new models based on our dataset using only freely available tools. It should be noted that when I use term "general" it refers to the ability for the model to generate a number for most compounds listed in ChemSpider. Obviously compounds that most closely resemble the training set are more likely to generate better estimates. Because of our synthetic objectives using the Ugi reaction we have mainly focused on collecting solubility data for carboxylic acids, aldehydes and amides either from new measurements or from the literature. Another important point concerns the main intended application of the model: organic synthesis. Generally the range of interest for such applications is about 0.01 - 3M. This might be very different for other applications - such as the aqueous solubility of a drug, where distinctions between much lower solubilities may be important. For a typical organic synthesis, a solubility of 0.001M or 0.005M will probably translate as effectively insoluble. This might be a desired property for a product intended to be isolated by filtration. On the other end of the scale knowing that a solubility is either 4M or 6M will not usually have an impact on reaction design. It is enough to know that a reactant will have good solubility in a particular solvent. Given the above considerations for intended applications and the likelihood that the current model is far from optimized, the predictions should be used cautiously. We suggest that the model is best used as a "flagging device". For example, if a reaction is to be carried out at 0.5M, one may place a threshold at 0.4M for the predicted values of reactants during solvent selection, with the recognition that a predicted 0.4M may be an actual 0.55M. A similar threshold approach can be used for the product, where in this case the lowest solubility is desired. A practical example of this is the shortlisting of solvents candidates for the Ugi reaction. I have also made the point in detail for the aqueous solubility of EGCG. Could this be the reason that so many different solubility models using different physical chemistry principles have evolved and continue to co-exist? The situation reminds me a lot of the discussions taking place in the molecular docking community. [Bissantz 2010] The differences in calculated binding energies are often small in comparison with the uncertainties involved. But docking can still be used as one tool among others to find drug candidates by flagging a collection of compounds above a certain threshold binding energy.